As we move into the new year, I remember a resolution I made to write more for Femulate. This also helps justify the luxurious office suite that I occupy here at the sprawling Femulate World Headquarters. It also compels me to spend less time at the water cooler sharing makeup and fashion tips. Although CEO Stana can be a taskmaster, we keep a close watch on the Dress Barn sales flyers knowing well those days are best for our long lunches. I am often asked by transgender persons who want to start expressing their femininity, "How do I start?" Whether you just want to experiment at home or want to go out and about as a woman, being a girl takes work and time and it truly is a lifestyle. It will take time to find your niche or comfort zone as a woman. It truly is an evolution. It’s important to enjoy the journey, new shoes, a good hair day, perfect eye makeup or your first steps out the door. I recommend starting with something that interests you, begin small. Maybe you want to get that first wig or start learning makeup skills. The important part is to start, nothing will happen if you do nothing. I’ll cover three areas where you can initiate a positive move toward your feminine core. First is makeup. Back in 2009 I approached the cosmetics counter at Lord and Taylor trembling inside asking for a foundation to provide good coverage. The first woman I spoke with directed me to the NARS counter. At this point I thought, “Oh no, they are freaking out,” but the young woman I met (Kasey) was polite and helpful. Over the next few months, I would come back to build my needed stock of makeup. Each time, Kasey taught me how to use the cosmetics and also encourage me. We had some in-depth conversations about transgender people and the world. During this time, she would extend the repeated offer of a makeover. I never would have dreamed of going out in public. But over that year I started to get my proverbial transgender wings and started going out regularly. Kasey worked for NARS and has since moved onto a career in the corporate world. So I became a devoted MAC girl. I cannot recommend them more highly. 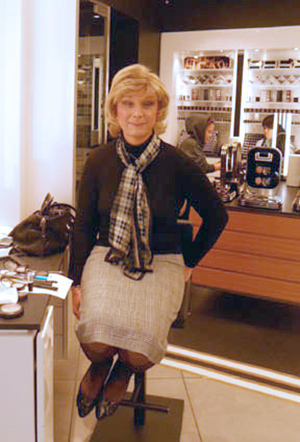 Other Femulate readers will concur that the policy at MAC is highly inclusive; they have many transgender customers and will treat you with the upmost respect. If you recall, MAC sponsored Caitlyn Jenner’s “Finally Free” lipstick and donated the proceeds to transgender youth. What you are really looking for as an emerging transgender person is to slowly open yourself up in a positive environment. You will begin to feel good about yourself and in turn, slowly build a collection of makeup and beauty products that will help you with your goals. The guidance and support you will get from the makeup artists at MAC will surely be worth the added expense of their product. There is nothing more liberating than telling another woman, "This makeup is for me, I am transgender." It all flows forward from there. Next week, we will talk about building a wardrobe. Jan Cina femulates Madonna on the Czech Republic' version of television's Your Face Sounds Familiar. Another fine post from Paula G. Thank you Stana for giving her an occasional platform to add her views in the practice of femulation.